According to Betsy Rogers, coupling the words “nature” and “New York City” is not, as most people think, a dichotomy. 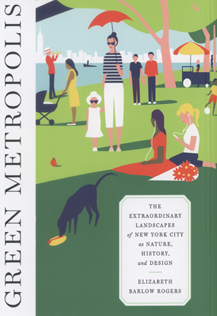 Her latest book, Green Metropolis: The Extraordinary Landscapes of New York City, is an exploration of seven New York City landscapes – some fortuitous and others designed. The seven pieces of New York's green fabric she has chosen to describe are the Staten Island Greenbelt, Jamaica Bay, Inwood Hill Park, the Ramble in Central Park, Roosevelt Island, Fresh Kills Park, and the High Line. Chosen for the stories they tell about urban nature, history, and landscape design, they illuminate the physical, social, and cultural factors that have governed the city’s growth and the building of its park system. In addition to describing the original appearance of, and subsequent alterations to, the parks she has chosen to write about, Rogers brings them alive through contemporary voices, including those of their caretakers, regular users, and fierce protectors. More than a guidebook, Green Metropolis gives clear directions on how to get to each of the landscapes discussed via car or public transportation. Now you can discover for yourself some special places within New York City’s five boroughs that you may have never known were there!